But how could this be? I've come up with three possibilities. Photo by Al Fasoldt. Copyright © 2014 by Al Fasoldt. All rights reserved. Click or tap the photo to see the original. This is a reduced copy of the original iPad photo, uncropped, of a portion of the southern sky over Texas. The moon is so overexposed that it's a bright blur. The two white dots are stars. 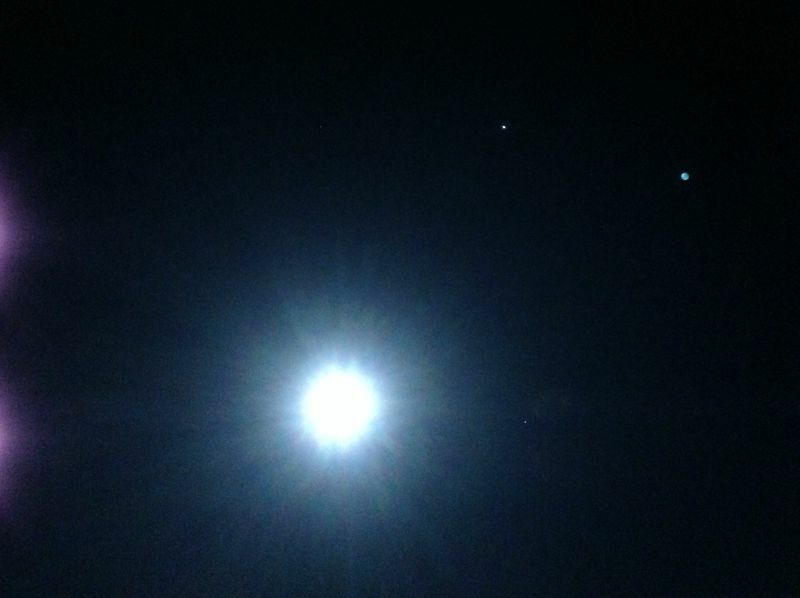 The larger blue sphere is Jupiter. The photo was taken by my iPad face up on a wooden platform in a campground, away from city lights, using a 1-second exposure. Click or tap the photo to see the full, uncropped, original photo. I don't know why I plunked down my iPad and took a picture of the sky the other night along the Texas coast. Surely I didn't think I'd see anything but stars alongside a bright moon. When I first looked at my iPad's screen, I was disappointed. The moon turned out to be a bust, far too bright for my iPad's night-shot setting. But then I noticed something off to the side -- a sight that was almost impossible to believe. I had taken a photo of the planet Jupiter, detailed enough to show the full globe of the planet with slightly discernible features. An enlargement of Jupiter, from the original photo, enhanced for clarity. And I'd done this not with a telephoto lens on a fancy camera or a with a telescope with a camera attached but with something millions of us have in our homes. An iPad. Years ago as a kid in school, I spent many winter nights looking through my homemade telescope. It was big, taller than I was, and used a 6-inch mirror. I was especially fascinated with Mars and Jupiter -- the first because I grew up at a time when Mars was still a mystery, hiding something behind its red mask, and the second because even my humble telescope showed me the globe of Jupiter with its moons. I could actually see Jupiter's moons revolving around the planet. My fascination with astronomy has never abated, so it was easy for me to check the position of Jupiter relative to the moon on that February evening. Jupiter was charted to be right where my iPad photo showed it. Even the stars near it mapped out properly. -- I placed the iPad on a heavy wooden platform, turned on a 20-second timer in the Pure app and walked away. The picture was taken with a relatively long exposure without vibration or camera movement of any kind. -- The night sky was exceptionally clear. During our annual winter stays in Texas, we've enjoyed star vistas unmatched by any we've seen elsewhere. I could hardly be more excited. The original photo, unchanged and untouched by JPEG processing, is here on my website. If you saw the photo in the newspaper. look at the photo here for better quality. Click on the photo above (or tap it on a phone or tablet) to see the original. It is unchanged from what the Pure app picked up from the sensor in the iPad 3's camera. Pure Shot, as many of you undoubtedly are hoping, also works on the iPhone. I'll review the app next week.